Apple released a new iOS 8.3 update for iPhone, iPad and iPod touch that delivers a new Emoji keyboard, tons of enhancements and a laundry list of bug fixes for iOS 8 problems on April 8th 2015, just a couple of weeks away from iOS 8.2 release. 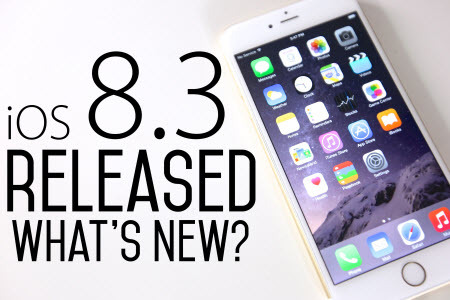 As expected, the iOS 8.3 update brings a ton of bug fixes for iOS 8 problems and it also delivers a number of enhancements to overall responsiveness, a new Emoji keyboard, some notable changes to Siri, and a whole lot more. The first thing you’re going to want to do, before installing iOS 8.3, is to get familiar with the changes that are on board the iOS 8.3 update. This is a massive update, bigger than most iOS updates, and you’re not going to want to install it blindly. Get started to be familiar with the new features coming along with iOS 8.3. Apple adds over 300 new iPhone emoji in iOS 8.3. There are new Emoji like the Apple Watch and a new Mac, but most users will focus on the addition of more family choices including more kids, families of two men or two women and now there is an option to change the skin tone of many emoji. Apple finally fixed the space bar on the iPhone so that you don't end up with periods instead of spaces when searching for thingds in Safari. The new space bar in iOS 8.3 is wider and the period is smaller so you will hit space when you need to and actually get the search results and search suggestions that you want. This is a small fix, but it's one that we are happy to see, especially for those of us who use the iPhone 6 Plus where the problem wsa more noticeable. While Apple CarPlay is still not widely used, the iOS 8.3 update adds support for wireless CarPlay. CarPlay is Apple's in car solution to put the most important iPhone information including messages, maps, music and Siri on your dash. Until now users needed to plug in with a Lightning cable for this to work. With this update vehicles that support wireless CarPlay will now work even when the iphone is still in your pocket. Consumers complaining about iOS 8 WiFi problems and iOS 8.2 WiFi problems may find some relief from this update. Apple specifically mentions fixes for WiFi problems. Time will tell if this can actually fix what some call the Wifried iOS 8 bug. Apple says the iOS 8.3 update, "Addresses an issue where some devices disconnect intermittently from Wi-Fi networks." This will also fix Bluetooth problems and an issue where the iPhone continuously asks for login information. Another place you'll find visual changes in iOS 8.3 vs iOS 8.2 is the messages app. Apple adds two helpful features that will help you avoid spam texts and to keep conversations organized. Go to Settings -> Messages -> Filter Unknown Senders and Tap On. This will toggle the settings so that you can see contacts and text messages in one section and unknown senders in another area. Apple also fixes issues with group messages splitting, issues deleting individual messages and some preview problems in messages. There is also an option to report junk messages right from the messages app when you get text or iMessage spam. If you use Apple Pay heavily as a high-tech credit card and you use Passbook for loyalty cards and other passes you'll appreciate the new separation that makes it easier to identify Apple Pay cards and Passbook passes and gift cards. This is a small change, but with more Apple Pay banks and Apple Pay stores it's one that Apple Pay users will appreciate. The Apple Watch will bring Apple pay support to the iPhone 5, iPhone 5c and iPhone 5s -- but you'll need the Apple Watch to make the actual payment. When you are looking at your albums in the Photos app on iOS 8.3 you'll now see a small icon in the preview image that identifies what the album contains. this may be panoramas, burst photos, slow motion or time-lapse. There are some albums that contain multiple types and don't show these icons. These only show up on the main Albums page, and we did not see them in iPhoto events and shared albums.